Home › Investing › What Is SVXY? 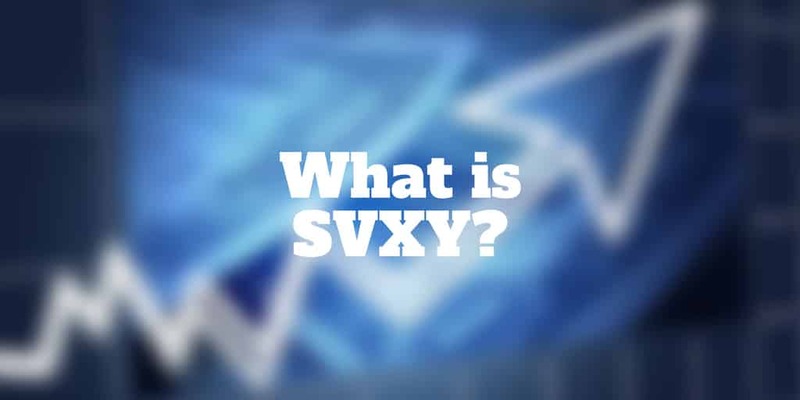 What Is SVXY? The ProShares Short VIX Short-Term Futures ETF [SVXY] is a bet against volatility. It’s as easy to purchase the exchange-traded fund as it is to buy shares of Amazon in a brokerage account at TD Ameritrade. But buying the ProShares Short VIX Short-term Futures ETF is in no way similar to buying a dividend-paying stock as part of a buy-and-hold strategy. Adventurous traders who have purchased SVXY in the past know it can be a highly lucrative trading vehicle but it is also fraught with risk. Before you put your hard-earned money into the SVXY ETF, you need to know the pros and cons which we cover below. Why Does SVXY Share Price Rise? What Is SVXY Stock Price History? Can SVXY Go To Zero? What Is The SVXY Expense Ratio? The ProShares Short VIX Short-Term Futures ETF looks to replicate the performance of one-half the inverse of the performance of the S&P 500 VIX Short-Term Futures Index for a single day. For emphasis we highlight that it doesn’t track on a 1:1 basis as it originally did when it first launched, but instead the results (before fees and expenses) correspond to -0.5x the inverse performance of the S&P 500 short-term futures. That’s a complicated way of saying when volatility declines, the SVXY is generally expected to rise and when volatility spikes ticker symbol SVXY usually falls. The security is designed for traders who want to bet against volatility spikes. So how does SVXY work? In order to track the inverse of market volatility through publicly traded futures markets, the ETF is set up to measure the returns from rolling long positions in the first and second month VIX futures contracts. As a result, buyers of the SVXY should expect that it will typically rise over time but when volatility spikes higher, the ETF will fall sharply. The tendency of the exchange-traded fund to rise in price over time means it will most likely undergo regular stock splits. According to SplitHistory, SVXY has undergone numerous splits in the past. In 2012, a 2:1 SVXY stock split took place, meaning that if you owned 100 shares before the split you would have owned 200 after the split, albeit at half the price. A couple of years later in 2014, another 2-for-1 stock split took place and finally a third stock split took place in 2017, which was again a 2-for-1 split. When these stock splits take place, no increase or decrease in market capitalization occurs. The value you own before the split is identical post-split but the share price diminishes to make it more affordable for new investors to buy. For traders who are new to volatility products, it’s reasonable to assume the SVXY tracks the CBOE Volatility Index [VIX] but it would be an error to do so. The SVXY mirrors the performance of the VIX futures, which behave very differently. When volatility spikes, the Volatility Index, or VIX, may rise significantly. However, the VIX futures may build in an expectation that prices will return to lower levels. Similarly, when you bet on volatility declining and it does indeed fall, you may not see a commensurate increase in the value of SVXY because the futures build in some expectation of future spikes in volatility. Nevertheless, history shows that the Volatility Index inversely correlates with the SVXY fairly closely. If you need to scratch your head after all that jargon, don’t worry because you’re not alone. In fact, it’s probably fair to say the SVXY can be so volatile that it is not really intended for first time traders. Before placing any real capital at risk, you should know how the SVXY price history changes over time and why it tends to rise slowly most of the time but fall fast some of the time. Over time, SVXY has a history of rising due to a process that few traders understand, called contango. Contango can be simply understood by visualizing futures prices rising over time. So, month 2 is more costly than month 1, and month 3 is more costly than month 2. As uncertainty rises over time, futures prices increase with time. But that is not always the case. Every once in a while a market crisis occurs and the short-term outlook is more uncertain than the long-term outlook, which causes backwardation, or a downward sloping futures curve. The slope of this curve is intimately connected to the way SVXY trades so it’s important to understand. When the short-term market outlook is calm, SVXY will usually rise slowly but when volatility spikes, SVXY will usually fall fast. SVXY is essentially the inverse of VXX, the iPath S&P 500 VIX Short-Term Futures ETN, albeit with different leverage. Traders who are worried the stock market will crash often purchase the VXX as a hedge against portfolio losses. If you owned stocks like Netflix, Facebook, Amazon, and Alphabet in your portfolio, and the market subsequently crashed then those stocks would probably fall too. But by owning shares of VXX, which can be purchased much like any stock in a brokerage account, such as at thinkorswim or tastyworks, the chances are VXX will rise in price while other positions decline in price. The problem with purchasing VXX is that over time it has a history of falling in price. And therein lies the opportunity for SVXY buyers. Because SVXY trades inverse to VXX, the long-term trend for SVXY has been to rise in price. If you think it’s “easy money” after buying SVXY however, think again! Before taking the plunge, you need to view the SVXY price history and know what to expect when markets are rattled by bad news. It’s true that SVXY can be held over the long term and has generally shown a history of rising prices. But it’s known to cause its fair share of heart-stopping moments along the way too. In early 2018, investors lost a fortune as SVXY plunged in price by over 80% in the virtual blink of an eye. In fact, losses were so fast and severe that trading was halted in SVXY. The takeaway is that betting against volatility is not for the faint of heart. Because of the extreme volatility in SVXY in early 2018, ProShares modified the investing goal from tracking the inverse of VXX on a one-to-one basis to only half that amount. That means price history before March, 2018 reflects a more volatile security than thereafter. Also when you search for an SVXY quote or SVXY after hours price, the number will closely match the inverse of the S&P 500 Short-Term Futures Index but may not be precisely accurate. This is due to the influence of deep-pocketed buyers and sellers, who may place large orders, which from time to time can causes prices to spike or dip away from market levels. When SVXY stock price deviations like this take place, market makers generally step in to match orders and keep prices stable. Yes, it is theoretically possible that SVXY can go to zero. But believe it or not this is not the worst outcome for traders betting against volatility. While the worst outcome for SVXY buyers it to lose all their money, traders who short VXX as an alternative way to bet against volatility stand to lose even more money because theoretically there is no limit to how high VXX can rise when volatility rises. If you are tempted to bet against volatility, the downside is limited when buying SVXY but is theoretically unlimited when shorting VXX. According to ProShares, the expense ratio for SVXY is 0.95%. Approximately $500 million is held in assets under management, so managers make close to $5,000,000 per year. SVXY may hold large cash positions due to the nature of the fund, which holds positions daily. So, it’s possible interest is collected on Treasury bills too. Who doesn’t love an investment that is almost certainly guaranteed to rise most of the time? What makes the ProShares Short VIX Short-Term Futures ETF [SVXY] so alluring is its price history of slowly and steadily rising since inception. But be under no illusions, this instrument can cause heartache in the blink of an eye. In the past it has crashed by 80%+, effectively wiping out SVXY buyers. If you can stomach such gut-wrenching volatility every once in a while knowing that, more often than not, the ETF will march higher then it might be for you. For nervous nellys who shudder at the thought of waking up to losses so large, other investments will be a better fit. Risk-seeking investors who can tolerate lots of volatility could consider SVXY as a way to bet against volatility. If economic clouds loom on the horizon or you believe markets are about to fall off a cliff, this is an exchange-traded fund to stay away from until blue skies appear again. And while SVXY is an ETF that can be traded much like a stock, remember it is based on futures prices. So, ideally it is best to trade it with a broker who understands futures and options well. Consider a leading broker like thinkorswim or tastyworks as opposed to a broker specializing in stocks or cryptocurrencies like Robinhood. Have you traded SVXY in the past? Share your tips in the comments below about how best to trade the ETF so other readers can sidestep the pitfalls.